Shipped ready to assemble. 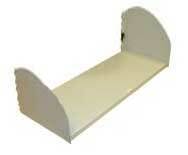 Unit includes shelf, shelf ends with anti-dislodgement mechanism and hardware. Painted flipper door front stows on top of the unit. Lock may be keyed to match pedestals. Assembly instructions included. For use on CMW and OEM panels. Shipped ready to assemble. 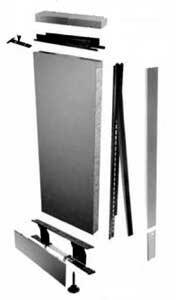 Unit includes shelf, door top, shelf ends with anti-dislodgement mechanism and hardware. Flipper door recedes into unit. Lock may be keyed to match pedestals. Assembly instructions included. For use on CMW and OEM panels. Kit includes all parts to produce a finished CMW panel:1 hard surface panel blank; 2 T-top brackets with screws, 1 top cap retainer and 1 painted top cap, 2 panel hanger frames, 2 lengths of sight foam, 2 plastic end caps, 2 painted steel bottom gates and 1 non-powered raceway assembly with steel side covers. Height is with base applied. Kit includes all parts to produce a finished CMW panel: 1 tackable/acoustic panel blank; 2 T-top brackets with screws, 1 top cap retainer and 1 painted top cap, 2 panel hanger frames, 2 lengths of sight foam, 2 plastic end caps, 2 painted steel bottom gates and 1 non-powered raceway assembly with steel side covers. Height is with base applied. Non-powered base standard. Steelcase® powerway styles FP and FPW in both 3-circuit and 4-circuit) Assembled full glass structure CMW panel with clear glass. Includes one (1) porkchop kit. Compatible with OEM except for visual difference in structural tube dimensions.